When Porridge was a wee kitten he toppled into a tin of tartan paint — which is easy to do and not so easy to say.Now he lives by Loch Loch with the quirky McFun family: Gadget Grandad, Groovy Gran, Dino Dad, Mini Mum and the twins, Roaring Ross and Invisible Isla. Everyone has a super secret — or two– and Porridge is always there to lend a helping paw when things go awry. If there’s a fishy biscuit in it for him…And things do often go awry in the McFun family. 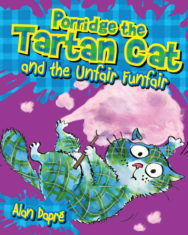 It’s a good job Porridge has nine lives!————–Porridge the Tartan cat (it’s a long story involving a tin of tartan paint!) and the twins Isla and Ross can’t wait to visit the funfair that’s just come to town — but this funfair isn’t fair at all. Riding the WulverCoaster doesn’t just turn their knees to jelly, it turns Ross into a ferocious beast!Dastardly Fergus McFungus is using the unfair funfair as a cover for his sneaky scheme to find the most powerful, most pongyful element in the universe: sproutinium. But why does he need to transform children into creepy creatures to do it?Join Porridge on this rollercoaster-riding, stink-digging, wulver-whiffing adventure with Isla and — Roaring Ross?! Can they stop McFungus from stinking out the whole town and change Ross back before he’s stuck as a beast forever?—————–In this zany new series for young readers, Porridge purrfectly CAT-a-logs the family’s hilarious adventures from a cat’s-eye perspective. With wacky twists, silly word play and meow-nificent illustrations in every chapter, readers won’t even want to paws for breath.